Scary words. What did it mean? Did we have a God-sized dream? Were we capable of acting on that little seed of hope in our heart? But we did just that. Some, cautious at first, merely cracking open the door to glance at what might stand on the other side, and others, throwing open the door wide. Throughout the next six months, we joined together on Tuesdays to write about our journey. In the middle of our stories of setbacks and success, of fears and fearlessness, of trust and terror, we saw God work. In each of the stories, God showed up in dreamers lives. Regardless of whether we understood the reason or the end goal, each and every dreamer stepped out in faith. God-sized dreams isn’t a gimmick. and the mountains trembled before you. He acts. On our behalf. So today we invite you share your God-sized Dreams stories from 2013. For some of us dreamers, the dream was more than we could ask or imagine. For others, the dream changed entirely. And for yet another group, God said wait, for now, dear one. The God-sized Dream Team is joining us today and we hope you will too! It’s simple. 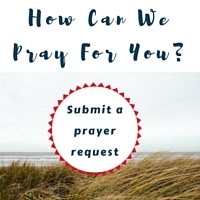 Write a post on your blog and link up below. For those who don’t have a blog, you can share in the comments or on Facebook. And link up again every Tuesday as we write about our dreams. We’ll be taking our weekly prompts from Holley’s Devotional, Opening the Door to Your God-Sized Dream. Next Tuesday, we invite you to share about giving words to your dream. Has it been a struggle? Every day this week, we’ll be featuring a special daily giveaway!! 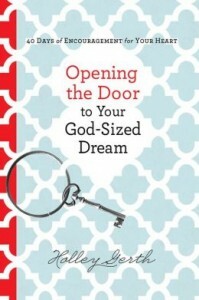 Today it’s Holley Gerth’s devotional, Opening the Door to Your God-Sized Dream, 40 Days of Encouragement for Your Heart!! You can enter via the PunchTab link below. We’ll keep all the giveaways open until Friday, 1/03/2014 at 11pm, to give everyone lots of time to enter! We’ll email the winner and you’ll have 48 hours to respond, or a new winner will be drawn. full of Thanks for the all of you! Hey Sonya!! Hugging you BIG!! I am so ready for God to “blow my hair back” in 2014! And, I can’t wait to read the stories of other dreamers linked up here today. Me too Elizabeth – even though our hair is shorter this year 🙂 Love you friend! I love the idea of this site. I love Holley’s books and her advice. After about a year of writing in a journal as I read her words and as I read the Bible, I found myself called to start my own encouragement blog. It has become a time of worship for me as I share with others how I see God in the world around me. I have been blessed with positive comments about how my readers are starting their day with my words. I feel like God is working through me and it’s so rewarding and humbling. Thanks for continuing Holley’s work through a website. I look forward to being a part of it and reading the stories of “God Sized Dreams” realized and in progress. How has my dream changed over the past year? I have realized my dream, finally! I always knew it was there, a deep down and most of the time stuffed desire, and through my healing journey (the end of a many-long-years fight) over the past four (almost five) months, I have realized my dream and what God has asked me to do. Now, the “get down and dirty” part of my dream. Action! How has my dream changed in 2013? Well. as my 2 boys got older (one graduating from homeschool highschool and one a senior this school year) it was time to pray more for me and my next direction – so God gave me a dream of going back to college for counseling. So my dream is still in dream stage but taking steps towards it! Leslie – great dream!! And this is an exciting stage to be in!! Can’t wait to hear more! We’ll be your cheerleaders!! My God-Sized dream that changed me this year was to start writing again. I have been so blessed at how God has used my words to share with others. I have been spending a lot of time over the past few days thinking about and praying through what my dreams are for the new year. That is awesome Victoria!! We will be praying for you as you continue on that journey in 2014!! Hi, Victoria! I smiled when I saw you here and remember you from linking up at Crystal’s blog several times. 🙂 Thank you for sharing…and many blessings to you as you continue your dreams this year! Thanks for the invite, Holley! I’m sorry, did Christine Wright author this blog post? Congrats Christine and the rest of you dreamers that made this site reality! What a wonderful example of following your heart and stepping out on faith. Hi, friend!! I always smile when I see your face!! 🙂 Thanking you for helping make one of my dreams come true for 2013!! Christine! 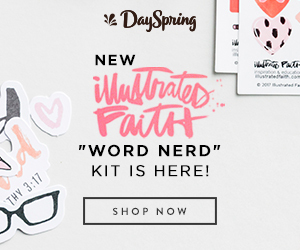 The blog is absolutely beautiful- so glad you have been faithful to take those scary leaps and follow your God-sized dreams. Yay, Kimberly!! We’re glad you’re here!! My dream of 2013 was to publish the book I’ve been working on. Didn’t happen but it the new date is in March, so my dream of 2014 is to get that book published! Oh, God’s timing can be hard to wait on. (We went through that with the website launch.) Let us know when it’s out, ok?? I am so excited for you Kimberly and so happy to see you here!!! In 2013, I began to believe that the dreams I wrote down in 1990 perhaps were not dead but dormant. It’s still fledgling belief, but it’s real. My dream has changed focus on “being a missionary abroad” to being a missionary at home” …. right where I am… to my family. Good article. I am facing many off these issuies aas well..
How Do You Know if Your Dream is from God?